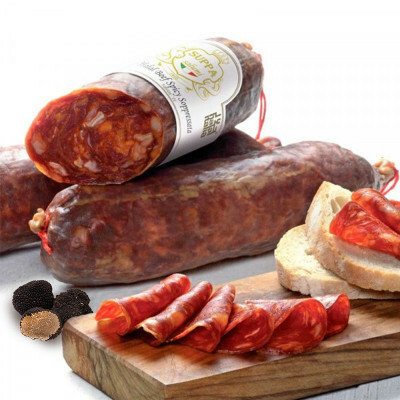 A certified beef salami, with an exceptional harmony among the Calabrian spiciness, the sweetness of the meat - typical of well-seasoned products - and the delicate aroma of black truffles. Surprise your guests with a unique product! One of the noblest traditional Calabrian cured meats, the raw ingredient used is halal-certified beef, minced, with truffle and spicy flavourings, then stuffed into natural casings, aged and smoked naturally.